Laurie Leitch gave us the first field report on Sept 19, 2008. Phase Three is off to a good start. Leitch and Elgart arrived a few days before the rest of the team and met with the translators (all graduate psychology students in Beijing except one) for the project in Beijing and got the project materials produced. Then we flew to Chendu with the Project Coordinator and translator, Helen, and one of the translators, Shelley. Rob Blinn also came with us for 2 days to help orient us. We all took the train to Mianyang. Had meetings in Mianyang and Jiangyou with Doctors Wen and Da to make arrangements for the training and fieldwork. The rest of the team and translators arrived on 9/16. We are a team of twelve…Jonathan (Roberta’s son) is also with us as an assistant to Helen and general computer and technical wizard….5 U.S. team members, 6 translators, and Jonathan. Helen is supurb…efficient and energetic. She anticipates what needs to be done and before anyone can suggest it she has done it…so our logistics are running smoothly….except the ones we have no control over (which are considerable). Dr. Wen requested that we do our first training in Beichuan since the need is so great…so we went by ambulance there yesterday and provided training and treatment to a group of about 25 judicial workers and staff. The group is experiencing so many traumatic symptoms that we did a truncated form of our training and provided treatment to them. All had lost family members as well as being part of rescue teams. Their tenderness toward eachother was very touching. The whole group went to lunch together with many toasts of gratitude and laughter. Officials from Beichuan stopped by to be introduced and there were lots of photos taken. More than half of Beichwan’s healthcare providers were killed in the earthquake so the ones remaining can only be spared for a day of training at a time. Fortunately, we have TRM formats for 4 hours, 8 hours, and 1-3 days…so we are able to adapt our workshop quickly as plans change and we attempt to meet the needs of these over-worked and highly stressed people. Upcoming trainings will include one day-long training for medical students and physicians and another for nurses in Mianyang and a day of fieldwork in Beichuan with adults and children. That will complete our work for Dr. Wen. We move the Jiangyou on 9/22 to begin a week of work there. Dr. Da informs us that we will be training teachers, physicians and nurses and then doing the 2 days of fieldwork with them. The plans usually change so we are prepared for whatever presents itself. The workshop in Chengdu for physicians (half-day) is scheduled for 9/28…our last day in China. Elaine and I will do it while the rest of the team returns to Beijing to do some sightseeing. Pat and Jonathan will download our photos to the internet soon…and you can see some of the venues, trainees, etc. I think there is a photo of the spider that was on Elaine’s pillow as she awoke her first morning in Mianyang. It was the size of my hand…I’m not kidding. Fortunately, the hotel assured us that it was not poisonous (since we all were waiting for more to appear in our rooms). We are now in the city of Jiangyou….approximately 1,000 people died here. We are doing a 3-day training followed by fieldwork for physicians, nurses, and medical students from Jiangyou as well as surrounding areas. We also have told Dr. Da that we will do a case consultation group for any Phase 2 trainees that are interested as we did in Mianyang. Elaine and I have decided to make the field reports more than a description of the general training being done. We would like the reports to offer our learnings and evolving methods for working as a team in a disaster zone providing somatic intervention. In this report we want to write about the team-building that comes from having a daily team meeting. We believe that it is extremely important in building trust and cohesiveness in a disaster zone to hold daily team meetings…it becomes a resource for the team in a context where there is so much dysregulation. It is the team’s pendulation from the traumatic images and stories of the disaster area to the safety and support of the team. And, I am recommending that future teams incorporate daily team meetings and some of these strategies into their own CHERP project implementation. When we first arrived together in Mianyang, we had our first team meeting…all 12 of us…5 U.S. team members, 6 translators, and Jonathan. Our goal was to begin to develop a sense of familiarity and cohesiveness among team members. With that in mind, in our first meeting we had everyone pair up with someone they didn’t know and tell their partner about the origin of their name. For the Chinese team members this meant telling about the origin of both their English and their Chinese names. Then each pair introduced their partner to the group by telling their partner’s name story. It was an incredible experience for us all. The stories of our Chinese teammates were often so moving that many of us had tears in our eyes. Next, we had people choose new partners and tell their partner about a time they did something that took courage and felt risky but came out all right in the end. This helped each of us realize some of the character strengths people were bringing to the team. Again, we all learned a lot about each other when each person reported on their partner’s story. Having information like this about each person has created compassion for the tensions that inevitably emerge and has given the whole team a sense of history with each member. At the end of each day we have a team meeting, everyone knows we will be meeting and we have all discussed what kinds of things can be done in the meeting. As we have evolved as a team, we have found new ways to use the team meeting. This daily ritual, like the introductory exercises in our first meeting, has contributed to our cohesion and trust. It has helped insure that the “energy field” is clear between us all. It encourages a focus on our process as a team not just the content of our teaching. At the team meeting we first check in to see if there are any issues that need discussion. People have been told that if they have a problem with someone, to try to work it out individually with that person, but that if the issue has broader implications that they should bring it to the team meeting. An example occurred with two of our translators. One had corrected another when they were doing the “stage translation” when Elaine and I were teaching. The one who was corrected was offended and angry. We let the two work out the individual feelings together on their own but discussed in the team meeting the ways the translators wanted to work together (we have 2 translators for each pair teaching in front of the training groups)…which translators were OK having corrections, what kind of corrections were OK to make and what kinds should be discussed after the training and not made in front of the trainees. The translators decided to have their own meeting to discuss the guidelines they wanted to have with each other. This felt like a healthy resolution to something that could have become a bigger problem on the team. Another way we use the team meetings is for case discussion. During the training day we have practice sessions in which we break the trainees into 5 groups (since we have 5 U.S. team members) and each U.S. team member does a demo in the smaller group (usually about 8 trainees) to illustrate the skills we have been teaching and then the trainees practice with each other, one pair at a time, under the guidance of the U.S. team member and a translator. We have found from our work in Africa that the intimacy of small groups for the demos works better in cultures where asking questions in front of a large group may not be the norm. In our team meetings we then discuss the finer points of the somatic work. This is of benefit to all of us and the translators (all of whom are graduate students in psychology) usually ask many questions. Their questions help us consolidate our ways of teaching and explaining our material. And also, we are mentoring these young psychology students…they have become our very best trainees and are feeling very confident about their grasp of the material…so much so that in our team meeting 2 days ago several of them asked if they could also write up case notes on the cases they translated and then compare their write-ups with ours (we write a case note every time we do a demo or work with a survivor in the field) to see if they are picking up the important somatic aspects of the interventions. We haven’t compared the notes yet but will do that soon. Another example of our translators’ growing confidence is that a translator now leads the grounding exercise we do with trainees early on the first day of training and each subsequent day. We had planned to start with a U.S. team member doing it but realized that the translators are eager to do some independent work and are fully capable of taking on this titrated leadership. There are some translators who are stronger than others in front of a large group, and finding a structured way to allow the less strong ones to be in the front of the training group (which they all are eager for) by conducting the daily grounding exercise for trainees has been very positive. We have a script that even includes the pauses needed for the tracking to occur…so the translator just has to read the script. It has given us a suitable way to involve the translators who may not be as capable of translating the didactic material in the “stage teaching” (as they refer to it). Without the translators we couldn’t do anything useful and this investment in them feels like a very good use of some of the team meeting time. And their appreciation and enthusiasm alone would be reward enough but we also have outstanding somatic translators as a result. A third way we use the team meeting is to re-orient and make needed changes for the day(s) ahead or to debrief unexpected changes from the day. All team members have input into the process and it also means that everyone knows why changes are being made and how those changes will impact their own work. There is so much that we cannot control and we often must shift our plans when we arrive at a site. The planning and debriefing we do in the team meeting helps everyone feel more grounded as we go into each day. We have oriented the entire team about the flexibility needed in a disaster area and have normalized the unexpected shifts required so that no one is destabilized by a departure from what had been expected. Another way we use the team meeting is to do somatic work with anyone who is dysregulated from the day. This wasn’t an original intent of the team meeting, but I think because the trust is now so strong that team members (especially the translators) feel safe showing feelings they may be having. This was especially true after we visited several sites in Beichuan City, including the collapsed middle school. The sights were very distressing to all but especially to our Chinese translators; and the distress was shown and expressed at the team meeting. Elaine and I both did some work with those who were distressed and the others saw their stabilization return…which was reassuring to them. It also gave a couple of them a chance to directly experience somatic intervention. At this point in our work we are slightly more than halfway through. We have many stories of our sessions with trainees and survivors (most of the trainees are survivors as well). At our team meeting tonight we plan to ask each U.S. team member-translator pair to describe a case they worked with and to see where that story would fit into our teaching material. We then plan to have the pairs discuss that case in front of the training groups when we are teaching the more didactic material. We have been told that stories we include that describe examples of the work in action make our teaching “come alive”…and we are sure that we include mostly case examples (with identities protected, of course) from our work here in China. But this new way of doing it will involve all the team members, not primarily Elaine and me, and all the translators in the more didactic teaching of each day. Using team meetings as an integral part of disaster work has many benefits to team solidarity and contributes to work with trainees and survivors by enhancing the self-regulation of all team members so we bring stable nervous systems to our work. We believe having daily team meetings is a major reason why this team is so well-grounded in the face of such extreme suffering. The next field report will be a discussion of cases that we are encountering here in the earthquake area. A man in his forties describes many symptoms he has been experiencing since the death of his wife in the earthquake. He describes how he cries all night long, overworks, and is constantly irritable. His team rescued more than 97 students from the collapsed middle-school in Beichuan City. Intervention: After checking if the distance between our chairs is comfortable for him I invite the man to notice the support of the chair against his back and under his thighs and seat….to simply notice and report on whatever he notices. Explanation: Traumatized people have usually felt out of control. Even a simple invitation to manage the distance between the practitioner and client can be symbolic of the initial return of relational control. Regarding attention to the chair’s support: As humans one of our very first somatic sensations of support comes in utero when we sense our spine against our mother’s uterine wall. It can be very soothing for people to be invited to sense support against their back. Intervention: I also invite the man to notice his feet on the floor and to just sense into that. Explanation: Groundedness with the earth is one way to assess presence, readiness for somatic tracking, as well as capacity to shift attention from one area of the body (support of his back) to another (feet on the floor). There are people for whom sensing feet on the floor (and especially pressing the feet into the floor) causes activation rather than calming…perhaps due to earlier experiences bracing to avoid a stressful or traumatic event). With both of these grounding interventions he was willing and able to report on what he noticed as he tracked the sensations. He reported a calming effect from doing the tracking. I felt we could safely move to the next stage of intervention, Resourcing. If he had been unable to track the grounding sensations it would be essential to stay with present-oriented work and very gradually titrate by asking his permission to use a little bit of touch. If he agrees we might put our feet on his feet to see if grounding sensations could be experienced. If that is not successful it may be that touch on a different part of his body (e.g., his back or shoulder) could be sensed…or you could ask if there is a movement he wants to make…even a small one. If he says, “no” you could ask him to imagine if he could move what part would he move. You would then have him sense that imagined movement. However, since he was able to do the Grounding I was comfortable moving on to Resourcing. Intervention: Before I start using the skill of Resourcing I often first use the TRI field cards and give a brief psychoeducational explanation of the way the nervous system works when it is in balance and what happens when it is dysregulated. I tell him I will show him some skills for helping his nervous system return to balance. I tell him that when he talks about the hard things that have happened for him that his nervous system becomes more activated. I show him the graphic (created by D. Poole-Heller) in the field cards and help him see why we want to use the Resourcing skill before we start working with the harder material. I tell him that using the skill will help bring balance. I ask his permission to show him the skill. And then I ask him what kinds of things are helping him get through life since the earthquake. Explanation: When someone has experienced such complex trauma as the earthquake it can be very helpful and respectful to offer an explanation for why we are asking about positive aspects of life in the face of such suffering. We give a set of our field cards to many of the clients we work with so they can use them once we are gone. The man told me that his two children and several other relatives had survived as well as some of the other men he works with (out of his department of 35, six had been killed and 103 of their relatives had died). Intervention: I asked him to tell me about his children…their names, gender, and a little bit about each one. I asked about their interests and he told me they all like to read, himself included, although his concentration has been bad since the earthquake. I asked another question about what he enjoys doing with his children in order to bring the focus back entirely to the resource sensations. I then asked him what he notices in his body as he tells me about his children. Explanation: It is important when working with the skill of Resourcing to intensify the somatic experience by asking several questions about the resource so that the resource sensations have a chance to build and become strong enough to be felt despite traumatic activation in the body. Trainees have a tendency to hear too little of the content of the resource in their eagerness to move forward. The man tells me that he notices the resource sensations in his chest and that they are calming to him. He tells me that since his wife was killed that his heart is black. Intervention: I ask him if the positive sensations have a color and I am surprised to hear that the sensations are pink. I ask him to really sense into the pink sensations in his chest…and he takes a deeper breath to which I draw his attention. Explanation: Since he spontaneously used a color in describing the traumatic sensations associated with his wife’s death I decide to also to invite him to use color for the resource sensations. Asking whether a sensation has a shape or color can be a helpful way to titrate activating material and it can also be a way to intensify a resource sensation by expanding the image. The deeper (parasympathetic) breath tells me that he has truly been able to experience the resource sensations and that his Parasympathetic Nervous System is available to him. At this point in the session I now have anchored the resource sensations and I also have a piece of traumatic material to work with (the black heart that represents his grief). Intervention: I ask him if it would be all right (invitational language) to shift his attention (pendulation) from the pink calming sensations in his chest to just the very edge (titration) of the black heart. Tears appear in his eyes and I invite him to just notice the wetness of the tears (titration). I ask what he notices as he senses just the edge of that heart. He replies that his whole heart is not black…that only half the heart is black. I ask about the other half of his heart and he says the other half of his heart is pink and that the pink half is his children and family members that are alive. I invite him to notice the shift…from a black heart to a heart that is half pink. And to just sense into the change. When he indicates he can sense the change I ask him if it would be ok to now put all of his attention on the pink half of his heart (pendulation). He says that when all his attention is on the pink half he feels “better.” I ask how the sensations let him know he feels better and he replies that his chest feels lighter. I ask him to sense the change…i.e. the lighter sensations in his chest. Explanation: When positive changes are reported by the client it is important to have them “sense into” the change before moving on. In doing this we intensify the somatic shifts that are occurring. In asking him to “sense into” the change I avoid asking a question that would require a labeling of his experience…this would take him up into his neocortex which would dilute the sensory experience of positive change. When he says that when sensing the pink part he feels “better,” I want to intensify that observation by deepening it to the sensation-level…this can be done with the question, “how do the sensations you notice tell you it is “better?”…or “how do you know to call it “better”? Intervention: I then ask him if it would be ok (invitational language) to shift (pendulation) back to the black half of his heart and sense just a little bit more of that half (titration). This time there are no tears but his jaw tightens. I draw his attention to the tighter jaw (tracking) that I have noticed and ask him if there is anything his jaw wants to do. He slowly opens his mouth a bit. I invite him to repeat that small gesture (slowly open and close his mouth) several times…very slowly (intensification). When he does this his arms tremble slightly (release/discharge) and when I draw his attention to that and ask whether there is anything else he notices in his hands he says he notices that his hands feel heat (discharge/release). I ask him to just stay with the heat. Explanation: Heat is a signal of release/discharge when it follows cycles of pendulation. We do not want to interrupt a release when it is happening since it is a sign that blocked energy is leaving the body. Intervention: When he says he is no longer noticing the heat I invite him to check back with his jaw. He tells me he still feels some tightness there but less than before. I ask him to just sense into the change. I then ask him if there are any sounds or words that want to come out…and that if there are he can either say them in “his mind’s eye” or aloud. Tears come to his eyes and he nods that he has said it in his mind. Explanation: I am thinking that the tight jaw may be blocked defensive energy associated with either the death of his wife or his horror at images from the earthquake. I wonder if he would have wanted to scream “No!” when learning of his wife’s death or make vocalizations associated with other earthquake-related trauma. I do not tell him my thoughts, I just use them in an open-ended way to ask whether any sounds want to come out (completion of the defensive response of fight vocalization). He doesn’t need to tell me the words or sounds…it is enough that he imagine them (it activates the same neural circuitry as if he spoke aloud). Intervention: I ask him to stay with the positive sensations in his thighs and see what else he notices. He tells me that he feels warmth in his legs. I encourage him to stay with the warmth…and then ask, “does it have a direction?” and he gestures down toward the floor. I invite him to slow the gesture down and repeat it a few times, just noticing (tracking) as he does it. He does a gentle gesture that looks like a brushing away movement. I can see his body relaxing as he repeats the gesture, his face relaxes, too and more color is in his cheeks. Explanation: At this point I do not need to ask him what he notices because I can see it in his body. Sometimes asking “what” questions detracts from the intensification of sensation that goes with repeating a gesture slowly. So, I simply nod my head. Intervention: Since our time is nearly up (I can hear the team gathering outside the office I have been working in) I ask him if it would be ok to check back with his jaw. He tells me that his jaw feels relaxed (and I can see that for myself). I have him sense into the change and then ask him to check back with his heart. He says that the black half is now more a dark gray and the pink half seems a little bigger. He takes a deep breath as he tells me. I ask him to just sense into all the changes that have happened since we began. He closes his eyes as he does this, slowly nodding his head. We have worked together for about 45 minutes through the translator. During the time we worked his colleague was at a computer in the office and several people came in and out. In spite of the lack of privacy (common in disaster work) the container of our work has felt secure and my heart feels so open to this big policeman…sitting with his grief as well as his half-pink heart. I am grateful that few words are needed in this somatic work…from him or from me. The body is telling the story…of tragedy and resilience. 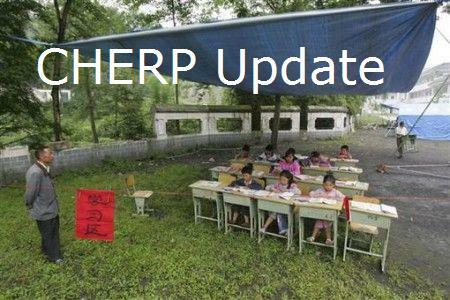 We were told we would train at the Beichuan Hospital and the next day work in the Resettlement Camp providing sessions. Each day, we gather for the hour or so ride in the ambulance for the trip. The seats are hard but the conversations are lively and at times, we sing songs from the 60’s and songs from our favorite show tunes. It is warm and humid and the smoke from our driver’s cigarettes permeates the air. Rita, Harriet and Rhine, our translators, sing Chinese songs. They giggle and we are touched by the rhythmic sounds of their sweet, clear voices. As we ride through the roads toward Beichuan, we are confronted with the ruins of the damaged buildings. We understand much has been cleared away but there is enormous damage; it will take months or years to remove the debris. There are also the vistas of new life. The crimson red of the bricks of rebuilding is threaded through the roadside alongside the blue tents of recovery. The color yellow of corncobs splashes the landscape of the roadsides, as they hang to dry in front of the blue tents. The roadways are full of life, children laughing and playing, people talking, riding their scooters and bicycles, and building new homes. Yet as we drive closer to Beichuan Hospital, the mood changes within the ambulance as the damage from the earthquake becomes more vivid and more global. The carcasses of ruined buildings floods us; there is a pallor in the air; the day is smoky from the fires of rebuilding; the mountains loom, surrounding the ruins, framing the damage making the images more discrete. We arrive at the hospital, and are guided to a medium size room, full of computers and two or three people working. An officer of public health greets us. They tell us that most of the medical personnel today are taking a mandatory exam and only a few people will be available to teach. The room slowly fills with doctors and nurses and the noise from the building distorts our voices as we try to speak. There is a sound of a chain saw, then a bullhorn and over a short period of time, 5 or 6 cell phones blast through the room; the room is like a tin can and each time someone moves a chair and steps outside, the sounds of movement vibrate and ricochet off the walls. The translators have difficulty hearing us through the commotion. The participants are clearly in a high state of activation. The staff is short-handed because of the exam. Also, half of the health care providers were killed in the earthquake. Because of the activation of the doctors and nurses, we decide to shorten the training and work the second part of the day providing sessions for them. Flexibility and change is as important as the air we breathe when we are in a disaster area. Later in the day before we return to Mianyang, Dr. Zhau, from Mianyang, our host in the field, takes us to the vista site, high on a mountaintop, so that we can see the City of Beichuan. The Chinese government has put a huge barbed wire fence around the parameters of the city, which is down in a valley. The barbed wire fence can be seen for miles. The local residents have set up food stands and concessions selling incense and photos from the destruction. It is the most sobering vista I have ever experienced. Cars drive up and citizens quietly leave their cars and with a solemn reverence look out into the valley that is now a tomb for literally thousands upon thousands of people. We were silent and many of us had tears in our eyes. The enormity of the loss was omnipresent. Next, we visit the ruins of Mianyang Middle School where 2000 children and teachers lost their lives. There is a skeleton of two stories of what was a 5-story building and a pile a rubble that runs wide and high. Within the rubble, vestiges of happier times are visible - school desks, notebooks and children's shoes are strewn throughout the rubble. Parents of the dead children have left flowers, bowls of fruit, poems, and colorful umbrellas at the site in memory of their children. We stand on the basketball court that was unscathed, our team of 12 and stare in silence, transfixed by the ruble and the loss. Our young translators are overcome with grief and those of us from America stand next to them with our arms around them as they shed tears for the innocence and the lost potential of each one of those little lives that will never grow up and who will be encased in this cement tomb for eternity. As we stand there in our grief, we are suddenly reminded of the resiliency of life when all of a sudden children’s voices laughing echo through the school site, as they play on a nearby hillside. When we arrived to the hotel, we had our team meeting and we are exhausted. We have learned to have a plan but not to be tied to any plan because arrival to our destination may present us with a different challenge. Our team members work well together and we have developed a nice collaboration with our translators. The shared experience and our intention to the group process have created a strong bond between the 12 of us. When we arrive, we are escorted to a large community room. Bookshelves of children’s books line one wall. There are desks at one end and many chairs in front of the desks. An elderly woman of 72 years of age arrives first and she tells us how she and her husband survived the earthquake and that the land for the resettlement camp used to be where her home stood. She is very talkative and tells us she is doing fine since the earthquake and is glad to be alive when so many have lost their lives. Within a few minutes, the room quickly fills with adults and children. There are about 40 people in the room and there is the rustling of anticipation, children are laughing and crying and they are waiting for us to speak. We begin by talking to the group about who we are and why we have come. I relate a short story about being in many earthquakes in California and how unsettling it is after always to feel like the earth is shaking when it isn’t and feeling shaky in my legs. The people responded to this personal experience and when I asked if anyone had had an experience like mine, the whole room practically stood up and shouted in agreement. We then share that we are going to show them some simple skills that might help them feel better. So we introduce grounding. Many people respond that they feel their breathing slowing down and then one women raises her hand and says she felt her heart rate go up when she pushed her feet into the ground. So, I ask her for permission to work with her. She answers in the affirmative and we begin to work. Soon after, each TRI team member is working in a corner of the room. Friends and family surround their family member who we are working with to give added support. There is also a great curiosity. Brenda Williams and Ellen Elgart play the games with the children. TRI’s children’s games vary dependent upon the culture. We researched the games common to the children of China. Our translators shared with us their favorite games of childhood. Culturally sensitive games we have found can become another positive resource. Also, most children’s games have some degree of sympathetic activation where we can track the children during the game and after the completion of the game to see whether or not the children can regulate back into their window of tolerance. In China, they have a version of a “tisket a tasket” called “drop the handkerchief” and “tug of war” that is called “pull the river”. We also have sheets and play parachute games that we have expanded upon from our research into Jane Ayre’s Sensory Integration Theory. Sensory Integration Therapists have used many parachute games since the early 1970s. Also, the book 465 Parachute Games is a very helpful book that describes many ways to use parachutes in healing play. We like to use sheets because our trainees can easily replicate the parachute games once we leave the area. Pat Kouwabunpat, MD, is a family physician, from the United States. He did his senior thesis for his family practice residency program on how to use somatic-based therapies in primary care medicine. He is a great help on the team. He introduces the TRM training by talking from a physician’s perspective on the importance of somatic-based therapy. He illustrates his presentation with stories from his medical practice from the United States. The doctors and medical students have been very interested in his perspective. The young woman was identified when during the group grounding exercise she became more activated. Her left foot and leg started to shake uncontrollably. She said that her legs always shake when she sits quietly. While walking, she reports that her leg is fine. Explanation: Shaking could be a discharge from the injury she experienced at the time of the earthquake or something else. Intervention: The decision was made to bring her attention to the sensation of shaking to see whether or not the shaking would lessen. Her leg’s movement lessened in intensity and the client took a deeper breath. The change was brought to her attention and she was asked to notice the difference. She activated her parasympathetic nervous system and a relaxation response resulted and her leg stopped shaking. Explanation: Grounding with the feet can result in some individuals feeling more activated and resulting in sympathetic hyperarousal. This is true especially if there is an injury to the legs or if there is an implicit memory capsule of bracing from past experiences. She recounted that she was pinned from her waist done by a large stone. As she recounted the story of being pinned, her leg began to shake again. As a result of her injuries, she was in the hospital for several weeks and she lost the toes of her right foot. Intervention: She was asked if we could try a different form of grounding that might help her. She said, “yes”. She was invited to draw her attention to how her back was being supported by the chair. When she did that she immediately took a deeper breath and her face muscles relaxed. Her leg temporarily stopped shaking as strongly. She smiled and reported that she felt more relaxed and she was invited to notice the changes inside. Explanation: The next treatment task is to establish resources. We wanted the client to experience once again her body’s ability to self-regulate to further anchor positive sensations within her nervous system. Intervention: The client was asked about what gave her strength or pleasure in her life. She responded “my children”. She was asked to tell us about her children who were part of the group and her older daughter was by her side and her smaller daughter was tugging at her shirt. She smiled warmly and told us how much she loved and cared about her children. As she described her children, she was asked to notice what was happening inside her body. Her body again went into a deeper sense of relaxation and she was invited to keep noticing it. Explanation: In the beginning phases of treatment, it is important to evaluate the client’s ability to experience the resiliency within the nervous system. The client had been very traumatized from the earthquake, hospitalization and separation from her children. She, however, could sense her body and access her parasympathetic nervous system. In trauma, people often lose the ability to sense their own healing capacity. The knowledge of her body’s ability to self-regulate can be another new resource for the client. She then began telling us about the earthquake. She recounted that she felt pressure and pain from her waist down to her feet when she thought of the earthquake. Her leg began to shake once again. Intervention: When asked if there was anywhere in her body where she did not feel the pressure and pain, she said, “my left hand.” She was invited to draw her attention to the left hand and to notice what happened next. She brought her awareness to the inside and said that she did not feel the pain and pressure in the same way; it was less. We invited her to notice the difference inside the body. This skill called “pendulation” was at first directive and then a spontaneous pendulation occurred which evidenced the body’s own capacity to heal. She was surprised to feel less pressure. 1. Use the skill of Titration and ask her to image the pain on the inside (does it have a shape? color, size? and then titrate it by, for example, sensing an “edge”. 3. Restore defensive responses by asking her if there “is an impulse” of what her body wants to do at this moment as she thinks about the pressure on her body. It was decided to use option number 2 to give her an internal experience of spontaneous pendulation so she would gain more confidence in her body’s ability to self-regulate. Intervention: She wanted to tell me the story of the earthquake. She was respectfully interrupted so as not to overwhelm her nervous system. She told us about the injury to her leg. Her leg began to shake again. She was then asked if she would allow me to hold her left foot. She said, “yes” and she was asked if she would push her left foot against my hand. As she did that, she experienced a big release; she felt heat, tingling and trembling. She was asked to draw her attention to the discharge/releases sensations. She then spontaneously said, “My leg feels safe for the first time since the earthquake.” I invited her to notice that and she felt a deep sense of relaxation and calm. Explanation: Sensing the large muscles of the body can help regulate the nervous system, whether someone is “Stuck on Low or Stuck on High”. In her case it pendulated her from a state of hyperarousal and brought her back to her window of tolerance. As she was sensing her window of tolerance, she suddenly, had a traumatic flashback and she shut her eyes and said she felt like the ground was shaking and everything was happening again. Her foot went back to the ground. Intervention: Deactivation strategies were immediately used. The client was asked to open her eyes and look around the room. As she did this, a deeper breath was noticed, she opened her eyes and reported that the sensations lessened. She was again invited to notice the changes. Explanation: Sometimes, if the parasympathetic nervous system response is sensed too deeply and not sensed more laterally, the person will flip into traumatic activation. Although this was not the intention, it happened in this case. It is important that the practitioner know deactivation strategies just in case this happens. Strategies including touch can be used to bring the client’s awareness back to the present moment. Intervention: Dr. Robert Scaer’s metaphor of “memory capsule” is an easily understood concept for most people. This is a simple way to explain implicit memory. Psychoeducation was threaded into the session. Memory capsules were explained. Explanation: Psychoeducation is an important way to normalize and depathologize distorted or misinformed beliefs about symptoms related to traumatic experiences. Intervention: She again went into a more balanced internal rhythm, and she was asked to tell us more about the moment she knew she was going to survive. She related the day she was released from the hospital and saw her children for the first time. They all cried and she felt like everything was better. As she told us about this, she was again invited to notice what happened on the inside. She again activated her parasympathetic nervous system, which was evidenced by a deeper breath. She also reported warmth, tingling and her face was released of tension. These changes were brought to her attention and she noticed the changes. Explanation: This intervention of bringing out the end of the story when the client can sense into the survival energy is another way to establish resources within the body. The client had many pendulations into resources and she was able to sense sensations of survival, happiness and release. When we have knowledge that the client can access positive resources and the client can pendulate out of traumatic material and back into the window of tolerance, we can move into helping the client restore the defensive responses. Intervention: She then started talking spontaneously about being pinned by the earthquake and as she did so she moved her hands as if she was pushing away the stones. She was asked to repeat the movement and then to notice what was happening inside. As she did so, her hands went into fists. She was asked what she wanted to do with the fists. She said, “I want to run. “ She was then asked if she could imagine that she was running and let her hands move in the way they wanted to move. She then moved her hands and feet in a way that looked like she was running. She was instructed to slow down and asked to notice what was happening inside as she was running. As she completed the defensive response, she experienced tingling, heat and trembling. She felt a sense a relief and brought her right hand to her heart and her left hand to her belly. As she went into this soothing position, she was invited to bring her attention to that. She again took a deeper breath and she said that she felt calmer inside like she really did run away from the earthquake. As she said that, she smiled and we could track that something had shifted. She then reported that she has had difficulty going to sleep since the earthquake. The images of the earthquake kept coming to her head. She shared with us that she could place herself in the position of her hands on her heart and stomach when she was going to bed. She thought this would help her sleep better and maybe remove the images from her head. As she was reflecting on this new thought, we invited her to sense her whole body and to notice the changes she had experienced since we started. As we ended the session, the woman smiled and she appeared more peaceful, her heart rate was in normal range, her breathing was even and her leg had stopped shaking. She was also instructed to repeat the spontaneous gesture of healing that had emerged at the end of the session and to sense into the posture at night and during the day to help her continue to sense into her internal balance. She was also encouraged to think about the shaking of her leg in a different way. We reminded her that when she allowed the shaking of her leg and noticed the release, she felt better in the session. So, if she allowed this to happen in the course of her daily living, we hoped for the same result for her. Explanation: At the end of the session, it is important to bring the client’s will help her body remember the changes. New neuronal pathways can be created that are now about her resiliency and her body’s ability to release the traumatic energy. This can also can establish another somatic resource. She then invited me to her resettlement home. So, the translator, Rita, the woman, her two children, a host of other smaller children and I, walked back to her home. The children loved the digital cameras and I took many photos of them and they wanted to see them all. Her home consisted of two small rooms with bunk beds and one full size bed. There were two small coaches, a TV and a table. She insisted that we sit down and have a snack with her and her family. She brought raw peanuts for us to eat. She asked me about my children and I showed her photos of my kids. We then told her we had to leave and she brought us a bag of peanuts as a gift. She has very little resources but culturally it was important that I received her gift. She gave me a hug and we took photos of her, her children and mother in front of the house. She thanked me for coming such a long way to help her. PHASE 3 CHERP FIELD REPORT #4 was sent out by Laurie on Oct 2, 2008. Elaine Miller-Karas, Brenda Williams, Ellen Elgart, Pat Kouwabunpat, Helen Fu, Shelley Liu, Rhine Liu, Harriet Zhang, Laura Ren, Rita Yujuan, Jonathan. Hard to believe that our time in China is over. The time went by so quickly. Our last week was spent in Jiangyou conducting a 3-day training and 2 field days for Dr. Da’s group of 24. Two people in the training group had also been trainees in Phase 2. They were definitely ahead of the others and it was nice to have them when we started into the field. During our week in the Jiangyou area we had the most rainfall that China has had in 100 years. In the night there were huge thunder and lightening bolts that knocked out all the electricity each night for 3 nights and shook the hotel. The shaking was especially disconcerting because our hotel had suffered damage in the earthquake and aftershocks. All of us had large cracks across our rooms and the glass in my room was also cracked. After the third day of rain half of the carpets in Elaine’s room and my room were saturated with water from unknown leaks. By the end of the week we were all glad to be getting out of that hotel. I was worried that all the rain would destabilize the ground our hotel sat on. The rain took a severe toll on the people of Beichuan City. We had spent several days working in the resettlement camps there and the day after we left there was a huge landslide and 40 people were killed and the roads blocked. This highlights the ongoing risk of doing relief work in earthquake areas. The land is so unstable and bare of trees that a big rain like we had has dire consequences. We laughingly (nervous laughter) reassured ourselves that at least we were traveling in an ambulance and had a doctor on our team. One highlight of the second week was our work at a primary school. As our ambulance pulled up we were surrounded by laughing, yelling children waiting in the rain for us. Their sweet faces were a total delight. We provided a trauma orientation to the teachers and then we had all planned to do the therapeutic games with the children. However, the principal was very concerned about his teachers, many of whom were highly symptomatic, and asked that we provide treatment to them. So Elaine and I and some of the trainees did treatment while the rest of the team and trainees did the games and treated the children. The school had been structurally damaged in the earthquake so the children were being taught in metal temporary classrooms. But we did our treatment and games in the original school building after the principal jumped up and down to prove that it was stable. Our last day of fieldwork was in a resettlement camp outside of Jiangyou. It was our last day with the trainees. We gave them all certificates stating that they had completed TRM Level 1. They were thrilled. We also gave a certificate of appreciation to Dr. Da who was a delight to work with. During our time in Jinagyou our translators made follow-up calls to any Phase 2 survivors for whom we had viable contact information. They also translated all the evaluation comments into English. Helen had rented a bus for the drive back to Chengdu. We each had our own seat. It was heavenly being in a clean, spacious vehicle after ten of us had been crammed into the back of the ambulance for a week. It was also nice not to have to haul all the luggage through the train station. We all spent the night in Chengdu and then all but 4 of the team went back to Beijing. Elaine and I and two translators…Helen and Rita… conducted a half day workshop for Dr. Yin and invited physicians. The workshop was held at the Third Provincial Hospital of Sichuan. When we arrived in the meeting room there was a huge banner that said (according to Helen) Somatic Experiencing Trauma Treatment Training. We took a photo of it for FHE. There were big bouquets of flowers on the two lecterns. There were 42 attendees…smaller than Dr. Yin had wanted because the next day began a huge national holiday and many of the doctors had to see patients before leaving for the 1 week vacation. The participants were enthusiastic and the evaluations were heart-warming. Dr. Yin said he still had funds left that he would like to use for another workshop in the future. It was my birthday (which Elaine had told the organizer) so at the end of the workshop everyone sang happy birthday and at the luncheon that followed they gave me a cake. It was a very nice way to celebrate. We had planned to arrive in Beijing by 7pm but our plane from Chengdu was cancelled due to mechanical problems. As we were looking for a place to sit until another flight could be located, along came Roberta Lipson who had been at meetings in Chengdu. In the 3-4 hours that we had before getting on another flight we all got to know each other well. We were able to let her know how much we had enjoyed having her 16 year old son, Jonathan, with us for the past 2 weeks. Many people put a lot of effort into helping CHERP become a reality and Roberta is one of them. We left China with feelings of satisfaction and gratitude. I believe that we made our small contribution to healing and I hope the teaching we provided will expand and deepen as trainees begin to put the new somatic skills to use. The U.S. team put a lot of effort into helping our translators expand their own understanding of somatic work. By the second week I think most of them could have conducted treatment on their own. We built in opportunities for them to have independent material to present (in the form of discussion of cases in front of the large group of trainees and conducting the grounding exercise we used every day of the training.). I think this investment in these hardworking psychology graduate students will help spread the visibility of somatic work in China. We gave them powerpoint presentations to take back to school so they could orient their professors and classmates to the work they did in behalf of earthquake survivors. In closing the last of Phase 3’s Field reports I would like to say a big thank you to everyone who has contributed to CHERP’s efforts. We never lost sight of the fact that without so many people providing administrative support, financial support, translation, and just plain moral support CHEROP would not exist. And a special thanks to Rob Blinn whose belief in somatic work and desire to help the suffering people in his adopted country has gestated into a full-blown multi-phase project. The Phase 3 Final Report will be forthcoming.